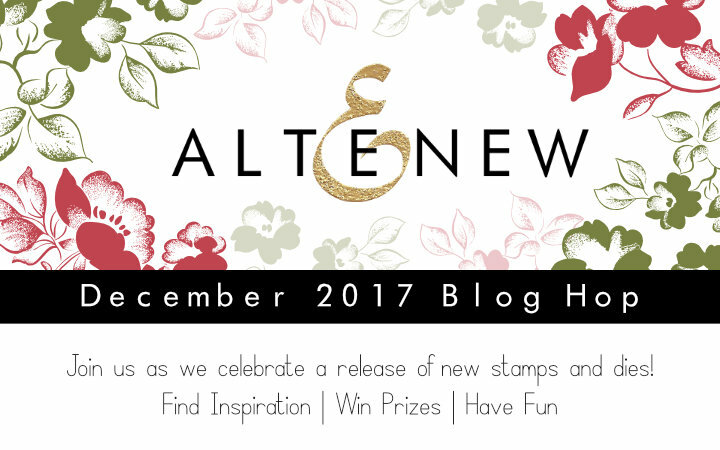 Hello everyone and welcome to the Altenew December Release Blog Hop! If you came here from Lilith’s blog then you are on the right track. Otherwise, go back to Altenew Card blog and start from there, as you won't want to miss anything! There are lots of fabulous products being released today! Stamps, dies and a Mini Blossom Die Cutting Machine! All are now available for purchase at the Altenew online store. 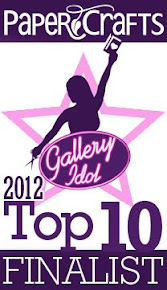 In addition, one winner will be chosen from the comments left on this blog post and will receive a $30 gift certificate! Today I've created three cards to share with you. 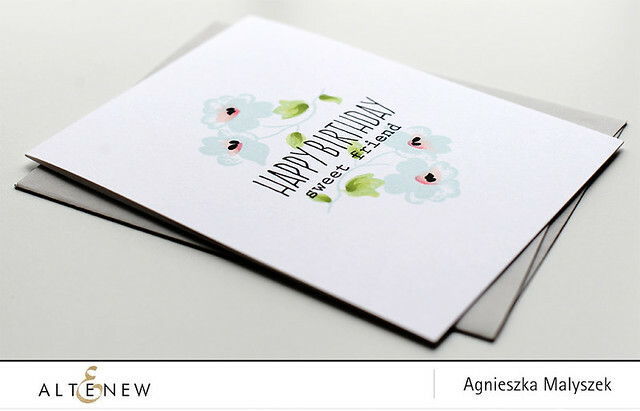 For my first card, I stamped images from Frosted Garden Stamp Set with blue and green inks. Then I used the Altenew markers to add some colour details to the flowers and leaves. 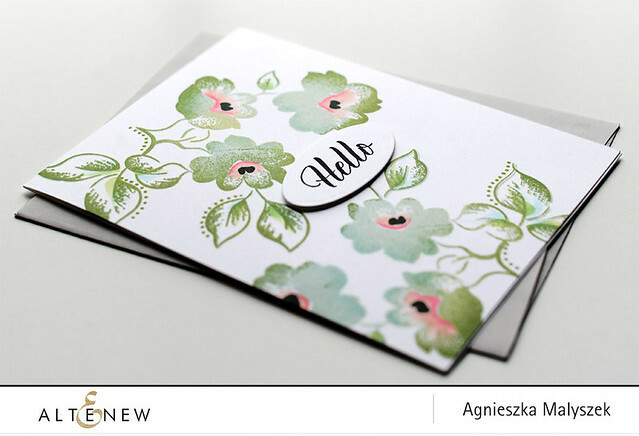 To finish my card I stamped Hello sentiment with black and die cut using a die from the Dot Labels Die Set. For my next card I combined stamp from the Frosted Garden Set with a sentiment from Birthday Builder Stamp Set. I also used markers to add some details to the stamped images. 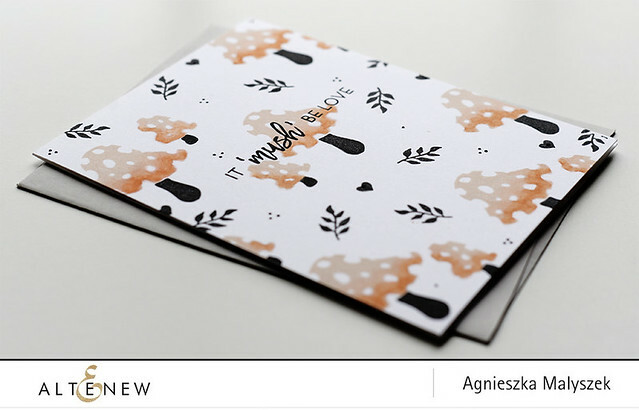 For my last card I created a stamped background using a new lovely set called Love You So Mush. I stamped images from the new set using Sand Dunes and Permanent Black inks and again used Altenew markers to mimic some watercolour look. To finish the card I added a sentiment and some small black details between stamped mushrooms (the leafy stamp comes from the Happy Holidays stamp set). That’s it for me, your next stop on the hop is Enza Gudor and I can't wait to see what she came up with today! Thanks for stopping by today and enjoy the rest of the hop! You have created beautiful samples! Thank you. Lovely cards and my fave is the Frosted Garden Stamp set! Your cards remind me work outside the box. Try new color combos. Beautiful cards today, you have been busy! I like the Dot Labels die set! Thanks for sharing your inspiration. Beautiful cards :) The mushrooms card is a pretty take! 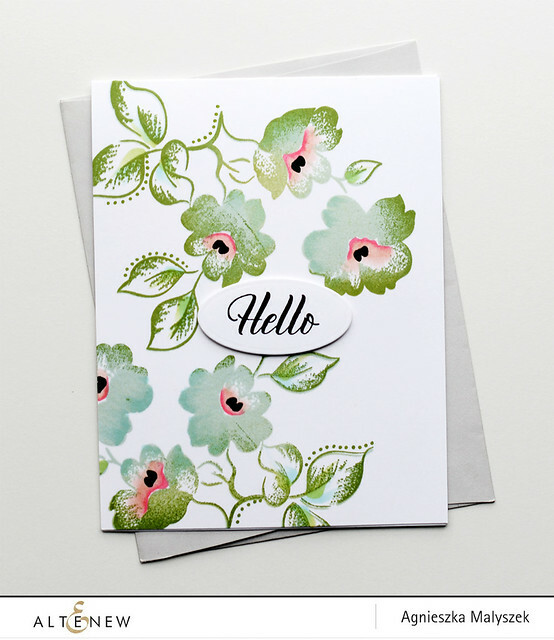 I love the hello card, such pretty green colors that compliment eachother very well. Great post! All pretty cards. I think the mushroom one is my favorite, simply because it’s a different theme than normally seen. Such pretty, delicate cards - love the touches of pink with the green and those mushrooms are the cutest things ever. So lovely! The mushrooms are fun!! All three cards are beautiful but I especially love the first one! I love the Frosted Garden set and you colored them beautifully! TFS! Wow, I love the first card you did. The blue and green on the flowers was unexpected, but beautiful! Beautiful cards! I love the colors!! These are all so beautiful!! I love the colors and designs of each one!! Love your cards, classic and beautiful!! Love your cards, the colors are gorgeous. Adore the Frosted Garden stamp set. Love your Frosted Garden card. The colors are so wonderful. Beautiful cards. Love that Frosted Garden set! Pretty cards. I love your techniques. Such lovely cards - I really love the frosted floral set and the touch of color you added with the markers just really puts them over the top! Gorgeous! Love the Frosted Garden set, and the mushrooms are so fun! Great cards! 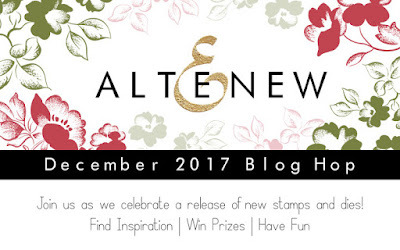 I mushi be in love with Altenew and all the wonderful creations on the blog hop! I love what you did with this stamp set. Your cards are beautiful. Thank you for sharing. I love your cards! I am really in love the with one with the blue flowers - so elegant! Gorgeous creations! I especially love the Frosted Gardens card! Great release! Oh my goodness I love your cards! They are so beautiful. The way you use colors is amazing. Love your cards!! I love the green & blues on your first two and your mushroom card is super cute...first time I've seen that set used in the hop!! Very interesting technique! So fun. Thanks for the inspiration. Great card design! Your mushroom card is adorable. I Love the flower cards, especially the first one! I lov ethe added color in the center of the flowers. I love the color combinations on your cards. Lovely cards. My favorite is the mushroom card. Really pretty cards, love the Frosted Garden set and the lovely details you added with the markers. Great cards! Love the backgrounds you created especially the mushrooms. So pretty! 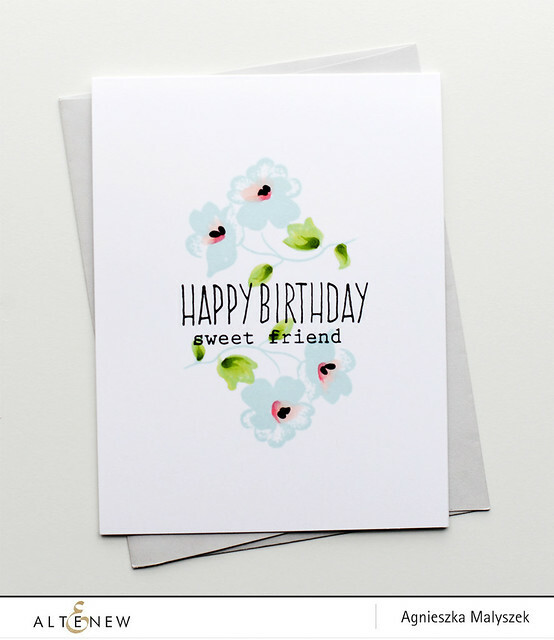 Loved your Happy Birthday Sweet friend card. Simplicity is beauty - thanks Aga! Thanks for sharing!! The flower cards are simple yet beautiful and complete. Well done. Hi! Your cards are beautiful! Thanks for sharing your creative ideas! Very lovely cards and perfect for mailing without all the layers. Great job. The frosted garden is my favorite set of this release and I love how you added the pop of color with the markers. Really beautiful. Such pretty colors, pretty cards! Beautiful cards with the Frosted Garden stamp set and the mushroom card is a hoot! Beautiful cards Aga! Loving the contrasting colors you used for the flower centers! Beautiful cards! I’m so happy you used the mushroom set, I’ve been hoping someone would stamp those adorable fungi! just LOVE your cards - very pretty! I love the colors you chose for these sweet cards! So many great products with this new release. Your cards are beautiful! Those cards are stunning....very simple in an elegant way. Beautiful florals and cute mushroom cards. The soft colour palettes on these cards are beautiful. Thanks for the inspiration. Love this release and the inspiration cards are gorgeous. 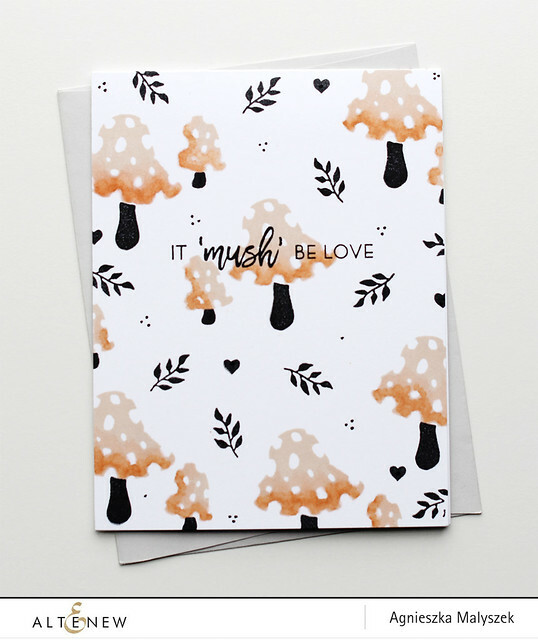 Especially loved the cute mushroom card. Fantastic cards! I love the mushroom card! Lovely cards. That frosted garden stamp is beautiful with the ink and markers. Cute cards! The new mini die cutting machine is too cute! Such a great release, thank you for the inspiration! Hello :) Just dropping by to know if the winner for this giveaway was announced..
Great post! Thank you so much for the share.. Here is a Website where you can get birthday wishes cards, quotes, for your friends, father, mother, brother, sister, girlfriend, boyfriend, kids..etc..